But back to the baking tins and the lack within. Baking makes me happy and I understand that has something to do with the “feel good” factor of providing treats for my offspring but also something to do with keeping my hands busy. If I feel a major grump coming on, it can be averted by getting out some butter & sugar and whipping up a batch of muffins or biscuits. And while tired doesn’t equate with grumpy though the two go hand in hand, I wasn’t up to creaming butter and sugar nor making a feather-light sponge (I struggle with that when I am in baking nirvana so I’m going to leave it in the too hard category). And so the tried and true trusted recipes come into the fore. Melt the butter and mix in a large pot sort of recipes. Anzac biscuits are a very Kiwi/Ozzie biscuit that the two countries scrap over nearly as much as the Pavlova debate and Jo Seagar has baked both the Kiwi and the Ozzie version in this short clip to determine which was liked most. Much has been explored and written about the history so I am not going there. Anzac biscuits are a classic and really don’t need improving. Filled with rolled oats and coconut and flavoured with golden syrup they can be moist or crunchy depending on the ratio of butter and sugar. 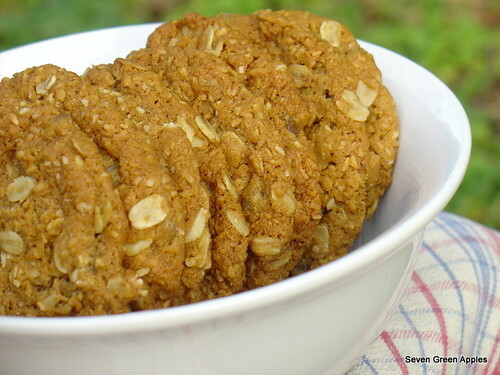 We like our Anzac biscuits to be a little moist and chewy. Crunchy Anzacs are looked upon as overdone and good for the chickens. Over the years I have made many different Anzac biscuit recipes but a few I return to when I need to get something in the tins quickly. There are plenty of variations and a lot of scope with Anzac biscuits – add fruit, chocolate, nuts or seeds for texture, use wholemeal flour instead of white, use oil instead of butter and so on. A quick search on the Chelsea Sugar baking website returns 8 recipes for Anzac biscuits and a google search proves just how many variations of the anzac biscuit already exist and so, do we really need another one? But what is one more – and that is when the baking fun begins – make a recipe your own with a tweak here or there, or an inspired addition such as apples and ginger (if I may say so myself). The following recipe is an adaptation of Jo Seagar’s Mixed-in-the-saucepan Anzac Biscuits published in It’s Easier than you Think. I called them Applezacs which appealed my 11 year old son, but bewildered the Anster until I explained that Apple Anzacs was a bit of a mouthful. Incidentally, Jo Seagar has another Anzac Biscuit recipe published in All Things Nice with Jo Seagar and can also be found here (the only difference being the book recipe having ¼ cup more white sugar). 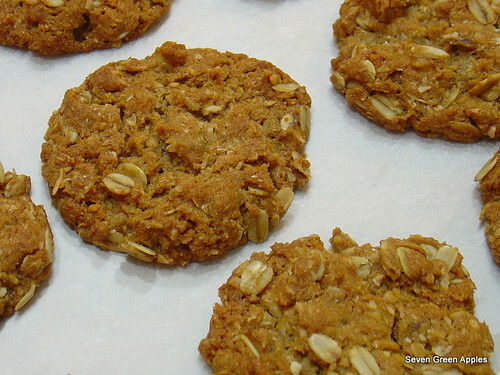 I have tried the classic Anzac biscuit recipe but prefer the mixed-in-the-saucepan recipe. I have given a measurement range for the appelstroop. If you like your biscuits to be crunchy on the outside & chewy on the inside then use only 2 T of the syrup. If you prefer softer biscuits that are chewy all the way through then use 3 T of the syrup. To get a more Ozzie like biscuit – use 4 T of appelstroop and you will get flat as a pancake but still chewy biscuits. Place the butter, water & appelstroop in a large pot over a gentle heat, until the butter and appelstroop is melted. Remove from the heat and stir in the baking soda. It will fizz – that’s okay, it is meant to. Sift the flour into the pot, then add remaining ingredients and mix well. Scoop 1 T of mixture and roll into a ball. Place on a baking paper lined baking tray, leaving room for the biscuits to spread. Squish flat with a fork and then bake for 15 minutes (18-20 if you like them crunchy). Remove from the oven and set aside for 10 or so minutes before transferring to a baking rack to cool completely before storing them in an air-tight container. 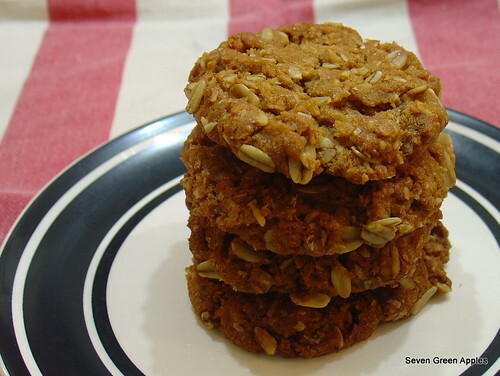 This entry was posted in Baking, Biscuits & Cookies and tagged Anzac & Apple biscuits, Anzac Biscuits, Anzac Biscuits with Apple & Ginger, Apple Anzac biscuits, baking, biscuits, cookies by Jo Dohrman. Bookmark the permalink. variation – substitute the ginger & apple for diced dried pineapple & craisins, and use golden syrup in place of apple syrup.